When the star of a film himself praises it so highly, you can’t help but feel that there must be something in its favour. 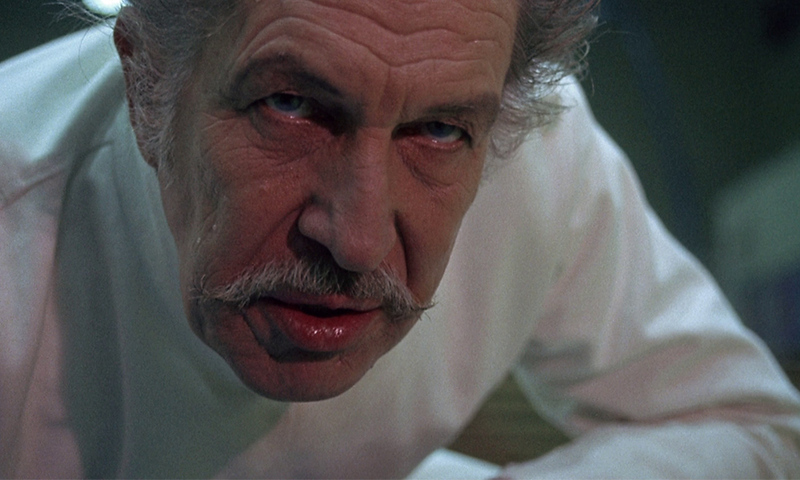 The above quote from the king of camp horror, Vincent Price, sums up perfectly Theatre of Blood (1973), the film which many people now see as one – if not the – best films in his long and varied career. Price could well take his place in the pages of film history as one of its most misread actors. Though mainly remembered for his horror work – an area which covered less than a third of an impressive body of work spanning more than five decades – Price’s versatility as a talented actor ranged from Hollywood costume dramas like The Private Lives of Elizabeth and Essex (1939) with screen legends Bette Davis and Errol Flynn to musical comedies such as Up in Central Park (1948) alongside popular singing star Deanna Durbin. Though Price had worked in London before, the four films he made there between 1971 and 1973, became milestones in his later work. The Abominable Dr Phibes (1971), Dr Phibes Rises Again (1972), Theatre of Blood (1973) and Madhouse (released in 1974, but actually filmed the previous year) encapsulated the sense of anarchy and fun with which he approached his chosen art form. The Phibes films especially – with their flamboyant theatricality – are often thought of as accompanying Theatre of Blood in all but name. The Phibes films bore all the trademarks of the company by which they were produced – AIP (American International Pictures) – who had been responsible for a slew of psychedelic movies during the late 1950s and 1960s such as Dr Goldfoot and the Bikini Machine (1965), and the famous Edgar Allan Poe inspired outings directed by Roger Corman. When compared, these earlier AIP films share obvious similarities with the Phibes titles and later Madhouse – small budgets, stark colours and of course the presence of Price. After the success of The Abominable Dr Phibes a number of sequels were rumoured, including Dr Phibes in the Holy Land, The Brides of Phibes, Phibes Resurrects and The Seven Fates of Dr Phibes. For various reasons however they never got made, and that which did, Dr Phibes Rises Again, though as inventive and fun as the first, was not a resounding success. As is often the case the sequel was rushed into production to cash in on the original’s success, and it showed. Instead Price found himself involved in a new project, Theatre of Blood. Though produced by a different company, in this case MGM, when viewed together Theatre of Blood and the Phibes films share many similarities. All area set in a Britain which either no longer existed (as with the 1920s setting of the Phibes films), or never existed at all save in the sanitised world of the movies (London has never looked as good as it did in Theatre of Blood). However these were both worlds which perfectly suited Price with his plumy tones and impeccable manners. Sam Jaffe – an agent and producer who had represented Price in Hollywood some years previously – was working as executive producer on a new horror / comedy project. He thought Price would be perfect for the role of Theatre of Blood‘s main protagonist Edward Lionheart, a slighted Shakespearian actor who exacts bloody revenge on a group of theatre critics whom he blames for destroying his career. Price jumped at the chance. Here he saw the opportunity to mix the seriousness of Shakespeare (which he’d always hankered after playing) with the irreverent fun of horror. Chosen to star alongside Price as Lionheart’s devoted daughter Edwina – who helps him in his dastardly decimation of London’s critical elite – was Diana Rigg. Rigg was the polar opposite of Price, a classical actress to her core. Though best known as Emma Peel in the 1960s television crime caper The Avengers, it was the theatre which was Rigg’s spiritual home. A member of The Royal Shakespeare Company and the National Theatre Company, she recalled how amusing she found it to be doing classics in the theatre, whilst simultaneously spoofing them up on film. Despite never having met before it appears that Price and Rigg hit it off immediately, and Rigg’s memories of working on the production are of great fun, to the extent that she regards the film to be amongst her all-time favourites. With two such prominent stars on board in the principle roles it was relatively easy to persuade the remaining cast to sign up, though a few of them had initial reservations; Coral Browne was the hardest to persuade, telling her agent that she had no wish to take on the role of the waspish female critic Chloe Moon in a horror film with Vincent Price. However, after gentle persuasion from friends and fellow cast members such as Jack Hawkins, she reneged. The remaining critics were brought alive by such household names as Ian Hendry, Dennis Price, Robert Morley, Michael Hordern, Arthur Lowe, Harry Andrews and Robert Coote, with cameo support from Eric Sykes, Milo O’Shea, Joan Hickson, Renee Asherson and ex-Bond babe Madeline Smith, resulting in a final cast which resembled a veritable who’s who of British thespian talent. If the group assembled in front of the camera was impressive, those behind it were of equal note. The film’s acid sharp screenplay by Anthony Greville-Bell – from an original premise by John Khan, the American-born producer behind the wartime drama Reach for Glory (1963), and Canadian Stanley Mann who later scripted such shockers as Damien: Omen II (1978) – was the perfect example of verbal logology. Though never in danger of upstaging the cast, the screenplay’s clever wordplay and use-age of Shakespeare’s original dialogue was perfectly at home amongst the film’s macabre proceedings and contemporary setting. With everything under the adroit guidance of director Douglas Hickox (father of Hellraiser III (1992) director Anthony Hickox) the final result came together effortlessly. Other locations included the long-gone Putney Hippodrome which, as it had been disused for years, made it perfect as Lionheart’s seedy lair; the spectacular gothic cemetery at Kensal Green in West London; a mansion on Chelsea’s Cheyne Walk; the gymnasium at the American School in London; the penthouse of Alembic House just across the Thames from The Houses of Parliament; the basement of hairdresser Robert Fielding’s salon opposite Harrods; and the grounds of Windsor Great Park. In truth though, when everything else is taken into account, one can’t help but be hit by the fact that Theatre of Blood is Vincent Price’s film. In it his character is, above all else, a ‘serious’ actor, which deep down is what he himself was. Viewing the film one can still sense Price’s enjoyment at the theatrical opportunity the role gave him, which may explain why he always said that the part of the slighted Shakespearian actor was amongst his best. And why, even after more than forty years, it still shows, perhaps better than any of his other work, the real Vincent Price. A digitally remastered edition of Theatre of Blood was released by Arrow Films on Blu-ray and in a Limited Edition Blu-ray SteelBook, in May 2014.